Funny how things "lost" from Elvis' concerts at Madison Square Garden in 1972 have been turning up lately. About a year ago some 100 photos taken at Elvis' second evening performance by a former Garden photographer were found, and now footage captured by an NBC camera crew that was filming the concert on June 9 has been discovered. 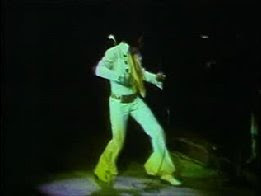 This footage, according to the Elvis Information Network, "switches back and forth between camera views of the audience and film of a very animated Presley performing "Polk Salad Annie" in front of the sold-out arena." Sounds exciting, doesn't it? Now, the good news it this footage is available as a videoclip on the Elvis Insiders site. The bad news is that only a preview of the clip is available if you're not a member. Still, the 15 seconds showing Elvis singing immediately after Jerry Scheff's bass solo, makes your mouth water. Both picture and sound are excellent, and I wonder if only "Polk Salad Annie" was filmed, or if there is more "lost" footage from the Garden that night. Another question I have is if part of the footage was shown on the NBC News Channel back then. I for one would love to watch that particular news broadcast. I have to admit, I've never consided becoming an "Elvis Insider." (It's $19.99 for 1 year membership.) But maybe I have to reconsider. What do you think? For some reason I remembered today that it was a long time since I wrote a "Special moments with FTD" post. Actually, it was about eight months ago. To catch up I'd like to mention no less than three songs releases on the FTD label that I've always thought were special. The first one is "Hey Little Girl" that saw the light of day on the second FTD album, Out In Hollywood, from 1999. I remember my brother getting his copy first, and sitting in his apartment listening to Elvis working his way through this early take from the Harum Scarum soundtrack. It's quite catchy and more loose than the master, but it's the ending that makes it all worthwhile. It's not often you get to hear Elvis exclaim first "Huuuuuh" and then "arrrrrrgh" (at least not on a movie song). As I've been known to write, great stuff! Moving on to the second song, I've always considered "I Just Can't Help Believing" a favourite, so I guess that's why I love the version on One Night In Vegas, released by the label in 2000. Actually, the record is one of the best by FTD and I listen to it frequently. Maybe the version recorded the day after is a stronger one. But I like the fact that the different mixing made me see the arrangement in another light, with the horns more prominent, for example. Not many Elvis songs make the hair on my neck stand out, but "My Boy" from 1975 released on Dixieland Rocks (2001) does just that. When Elvis holds the note during the ending, singing "Yeah, becaaaaaaaaaa" I always get emotional. It's Elvis when he touches me the most. To my knowledge Elvis sang "My Boy" in this fashion all through 1975, and you can hear it on Big Boss Man featuring the dinner show from Las Vegas on March 30, 1975. But I prefer the version from Murfreesboro May 6, 1975 on Dixieland Rocks, maybe because the sound is so much better. It seems there will be no more releases from the Madison import label. According to a message from those at Madison the latest release Rock My Soul (volume five in the Standing Room Only tapes series) will also be the last. Judging by fan responses, the label will be missed. I for one can understand why. As I've written before, I'm not heavy into bootlegs, but the quality of Madison's releases make them hard to ignore. I discovered that when I got myself a copy of Closing Night - February 1970 about a year ago. Not only was I impressed with the sound quality, the CD also came together with a 16-page booklet and good artwork on the cover. Since then I've obtained a couple of more albums from Madison, and never once have I been disappointed. One Night Only! 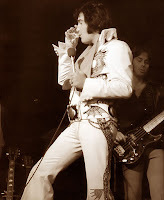 featuring Elvis gig at the Boston Garden November 10, 1971, must be regarded as a classic. And the double CD Holding Down The Fort presents the Elvis Presley show from Fort Worth June 3, 1976, complete with opening acts by Joe Guercio Orchestra, The Stamps and The Sweet Inspirations. I also like the fact that the soundboards from Madison doesn't have parts edited out, which is often the case with releases from FTD. That's strange, don't you think? After all, FTD is a colletors label, and my experience is that collectors want it all. I have never understood the reason to cut way the introduction on One Night In Vegas, to mention one example. So why is Madison quiting? I for one don't think it's because FTD has driven the label out of competition. As a matter of fact, to me, these two labels have been complementing each other lately, with Madison standing for quality when it comes to soundboards and rehearsals and FTD delivering excellent albums in the classic series. Granted, there have been some great soundboards from FTD too. But what I have never been able to figure out is why Jorgensen treat them and the classic series so different. Why is there no booklet included with photos and information, and why is there so little thought when it comes to covers and layout? But back to the reason why Madison says adios. I think the persons behind the label simply have run out of unreleased material. So I guess it's entirely up to FTD to provide the fans with new stuff now. Not an easy task, since so much have already been put out. But please surprise me, Ernst! So far this week has been a busy one when it comes to Elvis, at least for my mailman. Monday he brought me the April/May issue of the The Official Elvis Presley Fan Club of Great Britain magazine, Tuesday he delivered my copy of Madison's Opening Night - January 1970 and yesterday Blue Hawaii from FTD arrived. Starting with the magazine, I guess the biggest piece of news was that Todd Slaughter revealed that the CD the fan club is putting together will be "a unique theme album featuring those tracks which Elvis recorded which were written by UK song-smiths." The album is expected to be released in August and according to Todd, could be "one of Elvis most powerful and commercial releases for some time." The only British songwriter that comes to mind is Roger Whittaker, who recorded "The Last Farewell" and of course the members of a certain group called the Beatles. By the way, want to know what "The Last Farewell" is all about? Moving on to Opening Night - January 1970, I have to say it's just as impressive as its companion Closing Night - February 1970. Not only is the show first class (even "Teddy Bear"/"Don't Be Cruel" rocks), so is the accompanying booklet with liner notes and lots of photos. Also, the album includes the rare live version of "True Love Travels On A Gravel Road." As for Blue Hawaii, I'm afraid that one will have to wait until tomorrow. This evening is dedicated to Opening Night. Right now "Suspicious Minds" is blasting through the speakers and it's hard to sit still in front of the computer. So I'll sign off for now and go enjoy this fantastic CD one more time. 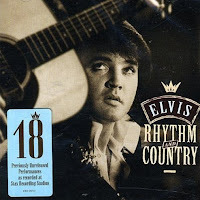 One of my favourite Elvis albums is Rhythm And Country, released in 1998. It's the fifth volume of RCA's "Essential Elvis" series, and can be seen as a kind of pre-Follow That Dream album, together with the fourth and sixth volumes (A Hundred Years From Now and Such A Night). As it was a while since I listened to Rhythm And Country, I decided to play it on my faithful Ipod sitting on a train bound for home a couple of days ago. And I was so impressed I enjoyed it one more time today, with the volume turned way up loud on my stereo. What makes Rhythm And Country so great is that it includes 18 alternate versions of songs recorded at Stax Studios in July and December, 1973. What's more, these versions lend another dimension to the recording sessions, being undubbed and in most cases, including different phrasing by Elvis. The album kicks off with "I Got A Feeling In My Body" and I just love the part where Elvis sings, "I gotta, I gotta, HOT DAMN!" Then it's on to a beautiful rendition of "Loving Arms" followed by "I've Got A Thing About You Baby" where it's pretty clear Elvis is in good spirits judging by the studio banter before the song starts. And so it continues, with great versions of songs such as "You Asked Me To," "Good Time Charlie's Got The Blues" and "Promised Land." Maybe the biggest surprise back when the album was released was the quality of the July recordings, showing a spark not evident on the original Raised On Rock LP (but very present on the FTD classic album version from 2007). Thinking back, the song I thought really stood out when I first listened to Rhythm And Country, was the funky take of "Find Out What's Happening." It's an opinion I still stick to, this version is way above the master. Before I sign off I also have to mention the alternate take of "For Ol' Times Sake" which is so beautiful it's hard for me to find the right words to describe it (at least in English). Also, I've always had a soft spot for "Talk About The Good Times," and the take included on Rhythm And Country didn't disappoint me, with driving piano and hand clapping. Now I can only wish for the millionth and the last time that the FTD classic albums Good Times and Promised Land soon will be announced. Then we'll finally get the material from the December 1973 session in the proper order and context, just like we did with Raised On Rock. Ernst Jorgensen. You are my only hope. Right now my brother is visiting and we just had this conversation (and a couple of drinks), listening to ”Heart of Rome” on my recently bought “I’m Leavin’” single. “Let’s compare it to the LP version. I've always loved the live version of "Patch It Up" and why Elvis only sang it twice in concert is beyond me. Maybe he thought "Suspicious Minds" was a better show-stopper, or maybe he thought the song was to demanding. Or maybe he plain didn't like it. Watching the version from Opening Night in Las Vegas on August 10, 1970, I think it's pretty safe to rule out at least two of my three guesses. Elvis was in great shape in the summer of 1970, and it's pretty obvious he enjoyed performing the song. So why did he sing it only one more time, two days later? You tell me. And before I sign off I have one more question: where can I order Elvis: That's The Way It Is - The Complete Works? Hello, My name is Duke Bardwell. I was Elvis' bass player in 1974 and '75 and played 181 shows with him on tour and in Las Vegas. I'll be in Sweden soon with the "Elvis Tribute Tour '09" and would like to invite you all to come out and enjoy the show with us. We'll be playing a lot of the ole Rock and Roll favorites with a few surprises in the show line up for you, so please join us, bring your friends and come on out to the party. Actually, the mail was forwarded by Arjan Deelen, the guy who's behind the Elvis Tribute Tour I've written about earlier, but I thought it cool, nevertheless. Over the last couple of months I've had e-mail contact with Arjan, and he's kept me updated how it's going with the show. And according to Arjan, there's one more date that might be interesting for Swedish Elvis fans, and that is May 19 at Feelgood in Halden, Norway. As Halden is a border town in the south of Norway, maybe some Swedes might want to see that one. The Elvis Tribute Tour will also will also be doing shows in Finland, Poland, Belgium and Holland. Arjan told me today that they're all very excited about the tour. Next month they will do two try-outs in Texas (including one as the warming-up for James Burton & band), and then on to Europe!